Made to be an all-in-one solution to your shower's needs, our AKDY SP0056 65 in. 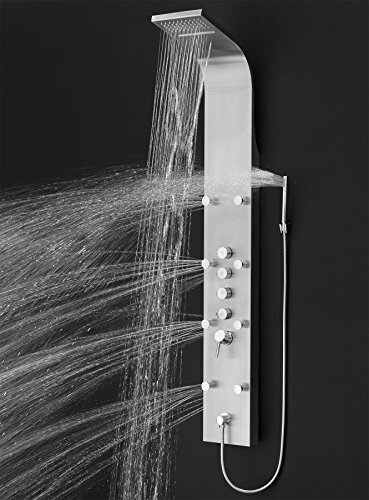 stainless steel shower panel has built-in temperature controls and features multiple modes. An overhead waterfall outlet lets water cascade down, while multiple shower nozzles gently spray your body for a soothing sensation. An included handheld wand keeps your showers flexible and provides freedom for hard to reach areas. All functions can be run simultaneously. This shower panel comes with our 1-year limted parts warranty and is covered against all defects in workmanship. If you have any questions about this product by Perfetto Kitchen and Bath, contact us by completing and submitting the form below. If you are looking for a specif part number, please include it with your message.